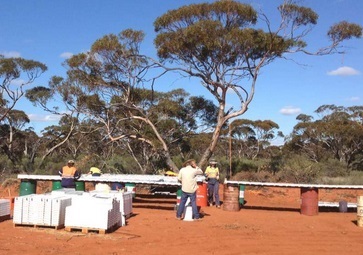 Impact Minerals Limited (ASX: IPT) is pleased to announce that it has successfully raised A$1.9 million, after costs, from its current rights issue. The result represents a 100% take-up of the right issue offer. The proceeds, together with recent previous cornerstone financial support for Impact, deliver the Company exploration funding potentially worth up to $9.3 million for its flagship projects at Broken Hill and near Orange in NSW, and at Mulga Tank, northeast of Kalgoorlie in WA. Of the 94,437,193 new ordinary shares offered, a total of 45,686,370 shares were accepted by Eligible Shareholders and a further 10,288,153 shares were applied for by shareholders as shortfall shares. The remaining 38,462,670 shares were placed to sophisticated investors under section 708 of the Corporations Act. The fully supported rights issue follows the recent significant capital investment into Impact by Squadron Resources Pty Limited, which will invest up to A$7.3 million in Impact, including an initial cash injection of $3 million ($1 million subject to shareholder approval), as announced on 17 July 2015. Squadron is the private mining investment vehicle of the Minderoo Group and represents the selected philanthropic and commercial interests of Andrew and Nicola Forrest. These commitments, as well as the rights issue proceeds, total up to $9.3 million, and will allow Impact to accelerate its exploration programs and forge ahead over the next year on each of its three projects. In addition Impact has been awarded government co-funding of $353,000 towards drill programs at its Broken Hill and Mulga Tank Projects. “We are delighted with the response to the rights issue with all shares being subscribed for and with more than 340 shareholders taking up their entitlement. "In addition, our major German shareholder also took up a significant portion of their rights. We are also pleased to welcome to the share register, a second German investor who subscribed for a large number of shortfall shares. "The drilling program underway at Broken Hill is the start of what will be the most exciting period in our Company’s history as we try to unlock the upside potential on all three of our flagship projects over the next 12 months. Impact Minerals Limited (ASX: IPT) was established to explore for deposits of uranium, nickel, Platinum Group Metals (PGM’s) and gold and listed on the ASX in November 2006. The Company has extensive tenement holdings in Africa and more recently Australia: a portfolio of projects with the potential for significant deposits of uranium and copper-nickel PGM’s. The Directors of the Company have extensive experience in mining and mineral exploration and a strong history of exploration success, business development and corporate management. Impact Minerals intends to build the business with a vigorous campaign of project evaluation and project generation for potential acquisitions and farm-ins, both in Australia and overseas. The Impact team is committed to achieving sustained and rapid growth through the vision of the Company to engage in world class exploration and resource development. The review of exploration activities and results contained in this report is based on information compiled by Dr Mike Jones, a Member of the Australian Institute of Geoscientists. He is a director of the company and works for Impact Minerals Limited. He has sufficient experience which is relevant to the style of mineralisation and types of deposits under consideration and to the activity which he is undertaking to qualify as a Competent Person as defined in the 2012 edition of the Australasian Code for Reporting of Exploration Results, Mineral Resources and Ore Reserves (the JORC Code). Mike Jones has consented to the inclusion in the report of the matters based on his information in the form and context in which it appears.